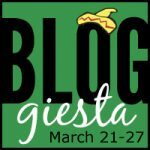 Bloggiesta is an event for book bloggers where participants work on blog housekeeping and improving their blogs. It’s hosted by MC at Blame It On The Books and Emily at Emily Reads Everything. Check out the Bloggiesta homepage and about page for more info. Hi everyone! The Fall 2016 Bloggiesta is here! It runs from 09/15/16 to 09/18/16, and I’m so excited to bring you a mini challenge for this round! 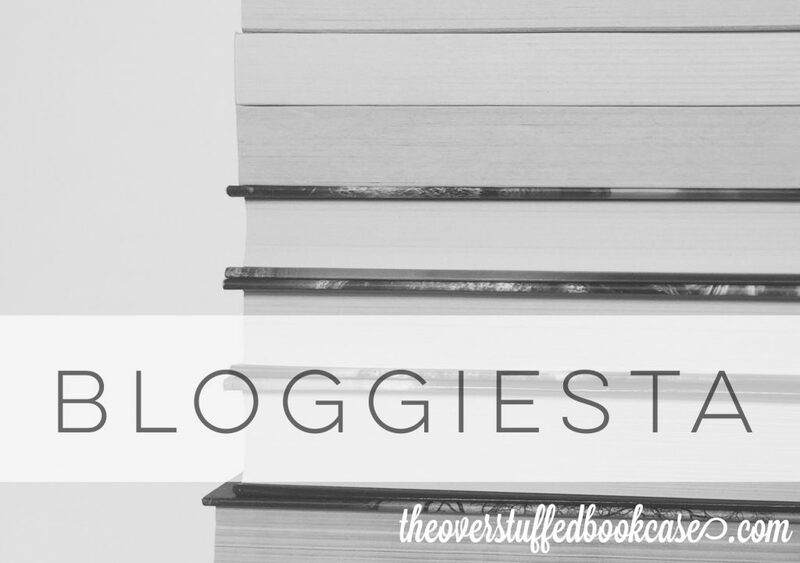 I love Bloggiesta and I always get so much done for my blog when I participate. And my mini challenge is all about helping you organize your blog and/or your reading a bit better. And there will be a giveaway! So let’s just get to it, shall we? Bullet Journaling is taking the world (or at least the internet) by storm these days, as are other types of planning. I personally have been bullet journaling for only a few months, and I use it for all aspects of my life, be it scheduling doctor appointments for my family, keeping track of my 2nd grader’s school projects, planning out my to-do list for the day, or planning for upcoming blog posts. If you’re not really sure what Bullet Journaling is, here is a great post for you to get a bit of a primer: WTF Is A Bullet Journal And Why Should You Start One? An Explainer. There are also lots of wonderful videos out there; you could simply search “What is a bullet journal?” or “Bullet Journal 101” on YouTube and find thousands of results. But I’m not really going to go into what a bullet journal is in this post. I explain a bit more in this post of mine: Bullet Journaling for Book Bloggers, but I don’t really go into much detail there, either. This challenge is more for those of you who already use a bullet journal and want to find a way to use it for your blog. But if you don’t already have a bullet journal, you could simply make a module on a piece of paper, if you want! I use my bullet journal for my blog and my reading A LOT. And now I’m challenging you to use a bullet journal for your blog! In my Bullet Journaling for Book Bloggers post, I shared a video and several photos of ways that I use a bullet journal to plan for my blog and track my reading. And the photo above lists off several of those ways, along with a couple other ideas that I have yet to implement into my own bullet journal. So the challenge for you: make a module (“module” just means entry or task or list) in your bullet journal that will help you organize or plan your blog, or track your reading. It can be as simple or fancy as you want. You can simply make a list or you can go creative and use a fancy layout or add stickers or washi tape. The important part: have fun with it, and make sure it’s something that you think will help you with your blog! You can use any of the ideas I’ve listed below, or make up your own! Check out my video below for more ideas, or browse some other ideas on YouTube or Instagram. The sky is the limit, just make sure it will help you with your blog, and make sure this is a NEW module that you are making now, not one you’ve made previously. You can use any of the suggestions above, or come up with your own ideas, and make your own module. Feel free to watch my video below for ideas, or browse Instagram or YouTube for more ideas. 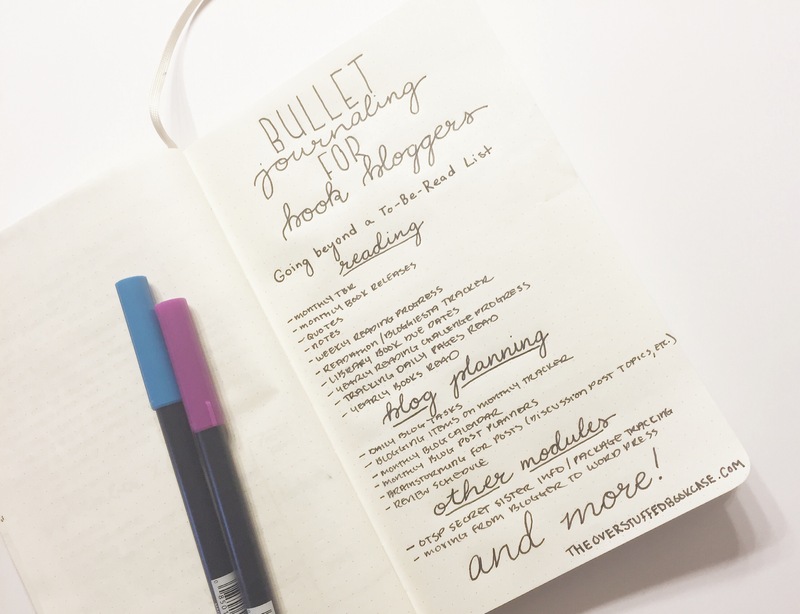 Once you’ve made your own bullet journal module for your blog, take a picture of it and share it on your blog, on Twitter, or on Instagram, and then leave a comment here with a link to your photo. Make sure that your comment includes a way for me to contact you (NO PERSONAL INFO, just a link to your blog or Twitter or Instagram account) so that I can get in touch with you if you are randomly selected as a winner. At the end of Bloggiesta, I will pick a random winner. The prize will be a $15 (USD) gift card to Amazon.com or a book of choice up to $15 (USD) from BookDepository.com if the winner is from outside the US. To enter, make a NEW bullet journal module that helps you plan or organize your book blog or track or plan your reading. You can use one of the ideas listed above, or make your own. Once you’ve made the module, take a picture of it and share it on your blog, Twitter, or Instagram. Then leave a comment here on this post with a link to your photo. MAKE SURE TO LEAVE SOME WAY FOR ME TO CONTACT YOU. DO NOT LEAVE ANY PERSONAL INFO IN THE COMMENTS, but link to your blog or your Twitter or Instagram, so that I can contact you if you are randomly selected as the winner. I will contact the winner after the end of the giveaway period. The winner will have 72 hours to respond, or I will choose a new random winner. Remember, have fun with this challenge! The point is to come up with a fun, new module that will help you better organize, plan, or track for your book blog. I’m looking forward to seeing what kinds of modules you all come up with! UPDATE: And the winner is: If the Book Will Be Too Difficult! I have contacted you via Twitter. Please send me a direct message and give me your email address so I can give you more info! I just dipped my toe into bullet journaling, but I really love it — it’s changed my work life. Can’t wait to incorporate it into my blog work! I have a really pretty little journal that my DIL gave me, and I can’t find it anywhere! I am known for hiding things in safe places, and then forgetting where they are. So I just used an ordinary notebook…sigh. Ten minutes in, and you’ve already given me one idea I think I can manage! “Habit tracking” my blogging — I love your read, comment, blog tracker — trying it out myself: https://www.instagram.com/p/BKYzkeCBEOD/. It’s not pretty — I’m not quite going all out until I’m sure I can still with bullet journaling — but so far it’s v appealing! Thanks for sharing your expertise — I love your video! her is my link. I started a list of review books I received and kept track of books read this month. I’ve been looking into bullet journaling and after reading this post and watching your video, I am super inspired to use one as my blog planner! I need to buy a notebook because I currently don’t have one that is empty but I will be back to post what I come up with once I get my notebook. Great post and challenge! Found you via Bloggiesta! I really REALLY love your blog page and design. I tried it. I’m not sure if I’ll stick with it, but I’m definitely giving it a shot. Thank you so much for a great mini-challenge. Sorted by month on one side, general list on the other side. I’ve only just adopted bullet journaling and was trying to work my blogging calendar into it but I love the idea of the blog having its own journal. I used to keep a separate book when I blogged more seriously so this won’t be that hard to get back into. Hey, there! Great job on your first video! I didn’t do Bloggiesta this time. So sad. I think this is the second one I’ve missed since discovering it three or four years ago. I started Bullet journalling in January of this year. I really do love it! I’m not a good list maker, and I’ve bought planners in the past that I’ve semi-filled out. I felt like I wasted a lot of paper leaving it empty. With Bullet journalling if I miss a month or more, I can just pick it up again and keep going…no wasted pages! Love that! My goal is to get better and better at planning ahead and being organized. I have to be honest, my book reviewing on my blog has fallen by the wayside, and it’s something that I want to get back into. So, I’m picking up my Bullet Journal and, hopefully, getting back into it! Oh, I take a ton of notes for the books I’m reading (to review) and I love to use those inexpensive composition notebooks. I buy a bunch at the beginning of the school year when they all go on sale!